Replies: 24 (Who? ), Viewed: 34336 times. 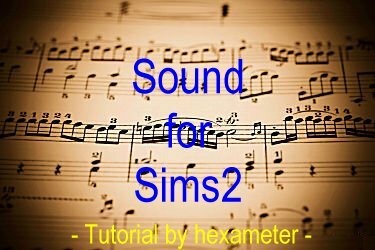 Here is a small tutorial for making custom sound for the Sims2. Based on the know-how and with permission of Shaklin. I wrote it after I gathered some experience with this method. This tutorial is for advanced and more experienced modders because I don't describe every single step or click you have to do. You should be able to use SimPE, a hex-editor, maybe a special sound software to prepare your sound package. Of course I assume that you know how to calculate hexadecimal numbers to decimal numbers with your calculator and know the difference between them. In one sentence: You have to know what you do! You can download the package of the needed resources in order to change them instead of creating your own or clone them from other packages. I hope you'll have much fun creating noises, sounds and music for your game as much as I do! Always keep in mind the copyright of music and sound! Jan. 2009: Added a German version of the tutorial in PDF-format. - Deutsche Version des Tutorials im PDF-Format angefügt. Credits and a big "Thank You!" to Shaklin! I read some questions about how to change the sound in animations. To answer these questions have a look at the first picture. Check your package at a similar resource in RAW-view of SimPE. Wonderful! I've moved this into the tutorials section. Thank you for writing this, it will be very popular! Thank you, Echo! I miss your updated carousel? Haven't had a chance to make the changes yet, I've been stupidly busy... But it will happen soon! Thank you, Hexameter, I'm sure many folks will benefit from this. It's just what I needed for an alarm clock project I'm working on! does this mean we can add new heavy riffs for the guitars? Not all that easily, because of the way guitars work. Remember that guitars are part of the general "band" system in the game, so other instruments have to be able to opt in (and out) of any piece of music. That means that we can't just switch out one sound file and switch in another. I was looking for an opportunity to ask this question, based on your statement here, is it possible to modify the in-game music played via-instruments?? Not really, based on the information I provided above. It may be technically possible, but certainly not something to be attempted by a rookie simmer. I've read the tutorial Hexameter and appreciate it very much. Thanks to you and Shaklin! She sure is an amazing young lady. I do have a couple of questions though. I tried to just replace your mp3 file with a wav file. Without changing the instances etc, just for test purposes. I'm not clear on how you name the sound file, is the sound name dependent on the package name? Do I just import the wav file by clicking on your music file and select import? I also didn't understand how to add the sound to an animation, is the only way to do this by way of wes_h's plugin? I couldn't find any option in the raw portion of the animation to allow me to add one. Is there a place to do this? Thanks very much in advace for any help. thanks for reading and the nice comment. ... I tried to just replace your mp3 file with a wav file. Without changing the instances etc, just for test purposes. I'm not clear on how you name the sound file, is the sound name dependent on the package name? No, it isn't. You can choose the package name as you want. The sound is called by it's name, for example "hansomr_tire_skid". This is what you do in the first steps of the tutorial making a new sound package and where the instances are created from using "fix TGI". You can call them in animations that are already prepared for calling sound by these names. If you know the names of other custom sound within your downloads you will be able to call them also like this. Simply replace the old name by the new one. If you want to delete/stop sound in those animations you simply delete the name. ... Do I just import the wav file by clicking on your music file and select import? That's correct. It's simple, isn't it? ... I also didn't understand how to add the sound to an animation, is the only way to do this by way of wes_h's plugin? I couldn't find any option in the raw portion of the animation to allow me to add one. I'm afraid that's right. I already suggested other methods but they didn't work. Maybe it's possible to use an animation that already contains a sound entry as a base for custom animations and modify it by changing the other contents. ... I couldn't find any option in the raw portion of the animation to allow me to add one. Is there a place to do this? At least I didn't find any option there, too, sorry. Maybe somebody else knows this. There is the possibility to call an effect in the BHAVs or to use the OpCode 0x0017 Play/Stop Sound Event and code it in BHAVs. I hope this can help you. Feel free to send me a mail if you have other questions. Wow thanks Hexameter for the very fast reply! I was going to email the questions, but I thought maybe others might have the same questions. I also know you are very busy too. I tired to figure this out a couple of times, but I'm doing something wrong. This is probably not as difficult as I'm making it. I was using the file hexameter_sound-resources.package. I did find the package you mention and I looked at that also hoping to figure out what you had done. The work you put into your Egypt Chariot is amazing. It must have taken you a long time to complete. It was very helpful but I do think the very first step is the one I'm having the problem with. I don't find a Fix TGI option. I tried to use the the fix integrity option under object tools and gave it a name. I thought the Fix TGI with a blue underline only changes the instance number. I think if I could get past this step I'd be ok. Thanks Hexameter for all you help. Please keep up the great work that you do also. I think it finally sunk in, sorry! I just reread the first part of your tutorial, I think I understand what you are saying now. The sound name comes from the instance numbers created by using the Fix TGI in some other package. Am I right? OMG I finally got it! LOL my sound is too loud and I think I have the length too long but it actually works! Thanks so much for your help Hexameter! This new skill will give me the ability to make creations that are so much cooler! I was convinced you'd get it to work! Loudness and length of the sound are minor problems, I'm sure. They can be fixed in different ways. Let me know if you need support. I'm looking forward to new cool creations with sound support! This message has been deleted by tetuo. #17 1st Feb 2008 at 2:42 AM Last edited by J. M. Pescado : 1st Feb 2008 at 8:11 AM. Is there any information about how vox files are packed in the game? I see references to vox_blah_blah_blah files, but I am not able to figure out how these files are hashed in the game. It seems to work differently from regular sounds. Nevermind, solved it: there's a _XYY portion added to the name pre-hash, where X is an age indicator like t/a/e, and YY is ma/fa. Great, thanks for this information! So when I use these sound files with the "Stop/Start Sound effect" primitive, the name of the sound file is found in STR# 4132, and immediately hashes to get the instance numbers. And these are the instance numbers of the TRKS/0x7B1ACFCD resources, which then point to the actual MP3 files? I guess I don't like that...it means there's a possibility of conflicting sounds. Also, is there importance in the 0xADD550A7 instance numbers? And where the heck do FWAVs fit in? Sorry for all the questions, and thanks ahead of time! The above post should be ingested with 1/4 Tbsp salt. In the event of an allergic reaction, panic and wait for the reaction to pass. #22 14th Jul 2008 at 4:29 AM Last edited by hexameter : 14th Jul 2008 at 4:40 AM. So when I use these sound files with the "Stop/Start Sound effect" primitive, the name of ... ? This is the way it works as far as I know. There might be of course a chance of conflict, but I guess if you choose the same name for a sound it only will override an other MP3 file that is already in your game. 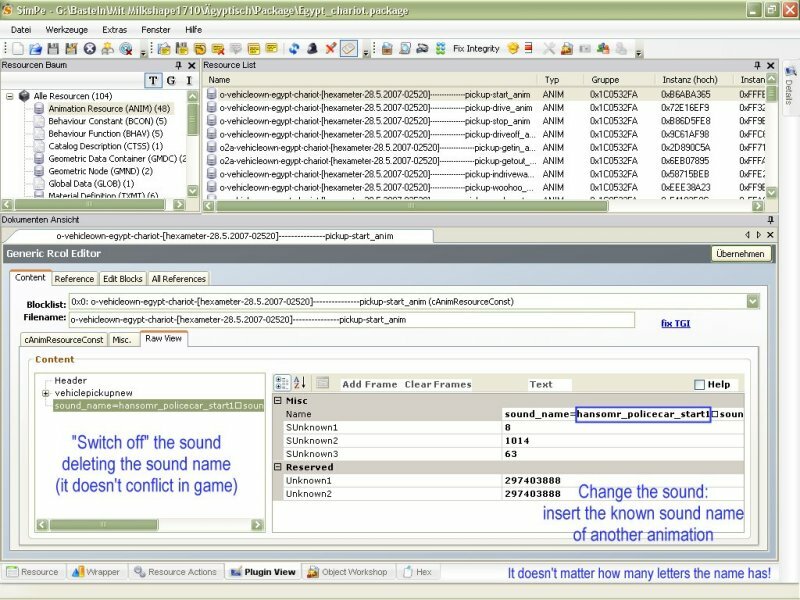 There are no problems so far to simply delete a certain sound effect in animations or change their names at will to suppress the sound. The game seems to recognize the sound using these numbers. Also, there are specific numbers for other sound packages. For instance the jazz musik uses Grp 0xFF67FFB, pop music is grp 0xFF23C3BF. 0xADD550A7 is as far as I remember the group of karaoke sound. It would be worth a test to use and change sound of other groups and see how it works. Unfortunately I didn't take the time for this, because I was content to have sound for my special purposes. WAVs are accepted as well as MP3-files. ... Sorry for all the questions, and thanks ahead of time! No problem, if you are satisfied with my poor knowledge of this theme. I always used this method more as practical rework than exploring all the background. Sorry, but this is a little complicated to solve. A step by step tutorial takes much time to do and there aren't too many interested people who want to use custom sound in their objects. But keep on struggling and I'm sure you'll solve the problems. I wonder if i could change some audio samples-files from the BOB 3942 synth (Free Time EP),and use my own audio files, because i would love to make this Synth like a real Audio sampler (Drums,basses,synths,percusions,etc. ), so my question is , can this really be done? i would appreciate any help with this . Thanks in advance!!! Just took a look and I'm amazed! I'm working on trying to get in-game voice changes to work, but it seems a bit complicated.